Kozmos Coney Island, located at 525 N. Main St. in downtown Milford, will host a free breakfast on Wednesday, Jan. 20 to raise funds for needy families in the Milford area. From 7 a.m. – 11 a.m., Kozmos will serve up complimentary pancakes and sausage, encouraging patrons to make a donation following their meal. All proceeds will benefit Community Sharing and local families struggling to feed their families and pay medical bills. Community Sharing helps provide ongoing support to more than 300 families in the Huron Valley area each month, more than quadruple the number of people that received assistance when the organization was founded in 2004. Kozmos wait staff, as well as representatives from several area organizations including Community Sharing, the Milford Downtown Development Authority and Village offices, Milford Rotary Club, Milford Police Department, Milford and Highland Business Associations, Carl’s Family YMCA, Huron Valley State Bank, National City Bank and the Huron Valley Board of Education will donate their time as servers. All tips will benefit the cause as well. Starbucks of Milford, Sam’s Club, Bazzi Food Service, Detroit Sausage Company and Direct Paper Supply are donating items to help make the breakfast possible. 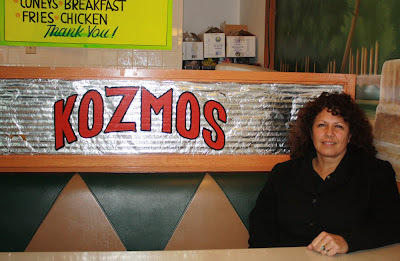 For more information on the fundraiser, call Kozmos Coney Island at (248) 210-0623.